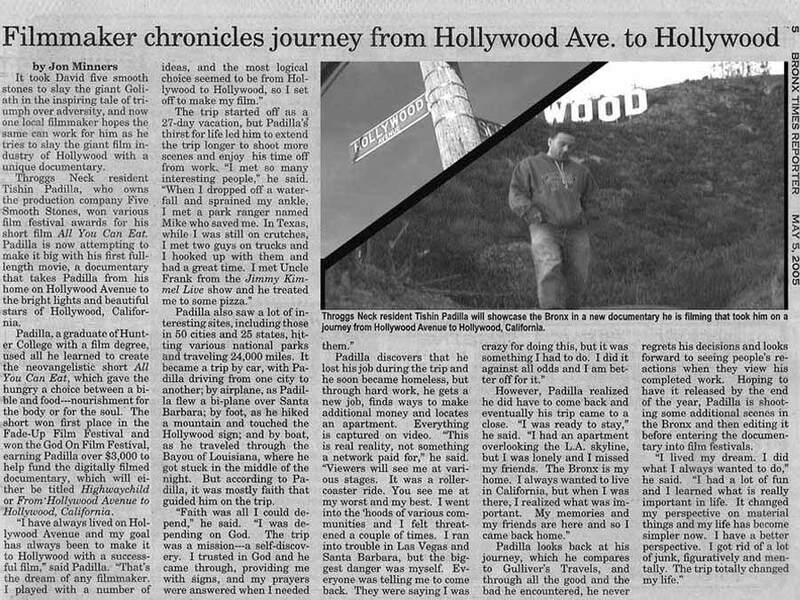 "Filmmaker Chronicles Journey from Hollywood Avenue to Hollywood"
The Bronx Times did a story on Five Smooth Stones prior to the Highwaychild project. I contacted them and asked them if they were interested in this project. They were and Jon Minners was kind enough to add this to his personal website. After returning to New York in 2005 I received an email from News 12 the Bronx letting me know that they were interested in doing a story on my film, "All You Can Eat." I told them that they could do that story if they liked, but I let them know that I had a better story if they were interested. I told them about the "Highwaychild" project and they decided to do that story instead. My friend Phil Sexton started his Youtube Channel a while back and interviewed me for his channel. I appreciated the post, so I posted it here also. I just wish he would have changed that hideous thumbnail image.